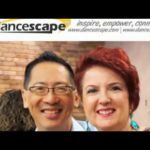 Many thanks to Cheryl Michelle & Caleb Danger Blackwell and the Millennial Network Group @danceScape Salsa/Latin night for their awesome energy and food donations for our Food Drive (Hamilton Food Share). Thanks Laura Rietmüller for being our co-teaching partner, hahahah! This group is breaking the “myth” about Millennials – clearly, Millennials are not only community-minded, but also are passionate about their careers and inspired by new and fun experiences! #shallwedance?